Contents and Media: One A5 decal sheet and an A4 size, b&w colour scheme and decal placement guide. Advantages: Beautifully printed, thin decals covering some interesting and unusual subjects. 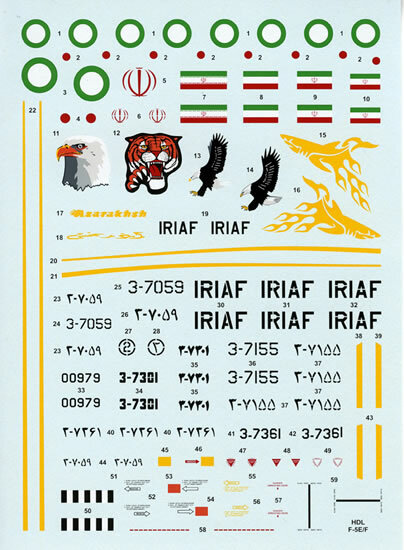 This sheet from Hi-Decal provides markings for four F-5E/F Tiger IIs (one of which is a locally upgraded version known as Azarakhsh) in service with the Islamic Iranian Air Force. F-5E 73-00939 / 3-7059 of the IRIAF in the standard Asia Minor colour scheme of sand, dark brown and dark green over light grey undersides. 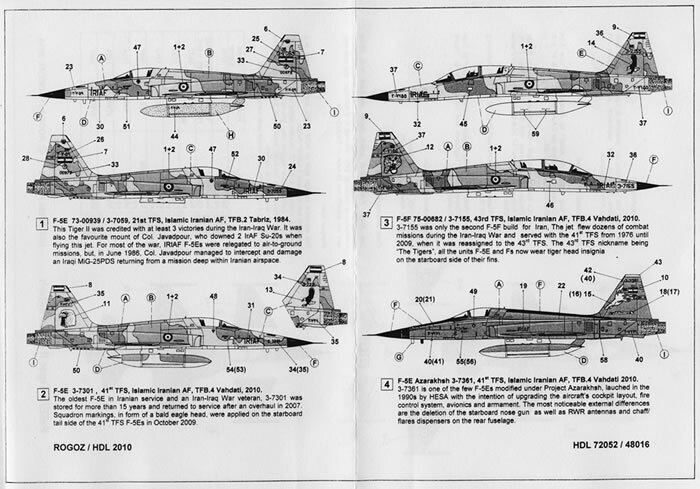 F-5E 3-7301 in the Asia Minor scheme but with a flying eagle emblem on the left and a large eagle's head on the right side of the fin. F-5F 75-00682 / 3-7155 again, in the Asia Minor scheme but with a flying eagle emblem on the left and a large tiger's head on the right side of the fin. F-5E 3-7361. The final airframe on the sheet is one of the locally upgraded versions known as Azarahksh in an overall dark green scheme with black and yellow trim and a large, yellow flaming shark design on both sides of the fin with the Azarakhsh name in Arabic on the left and in English on the right. The paint schemes, decal placements and a very brief history for each aircraft are provided, in black and white, on a double sided A4 sheet. Acknowledgments, recommended kits and suggested references are also listed as well as a colour table (in shaded greys) with FS-standards for the original colours and recommended equivalent colours (or mixes where required) for the Humbrol and Model Master ranges of paints. Information is also provided for common weapon loads for combat missions as well as a brief note about the colour schemes, pointing out that, after long years of service and repaints, the stenciling on these machines was at a minimum. The decals themselves look very thin, crisp and appear to be in perfect register on my sheet with separate red centers for the roundels. The stenciling which, as mentioned above, is only minimal on these machines, includes four different styles of rescue markings, three styles of ejection seat triangles, turbine warning stripes (only used on one scheme), arrestor hook stripes and stencils and some stencils for external fuel tanks. The thin yellow trim of the Azarakhsh version is also included as decals. 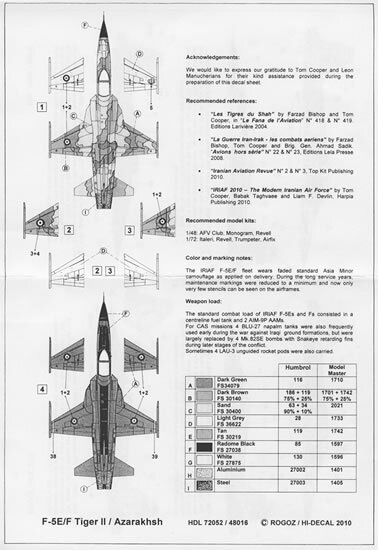 Hi-Decal has produced a high quality sheet sheet which gives modellers some welcome, added variety to do some of the less-covered but perhaps more interesting schemes on their F-5E or F kits in 1/48 and 1/72 scale. Hi-Decal decals are available direct from the manufacturer, Diego@HiDecal.